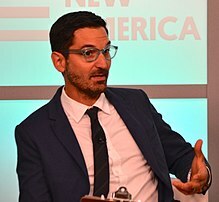 Guy Raz /ˈɡaɪ ˈrɑːz/ (born 1975) is a journalist, correspondent and radio host, currently working at National Public Radio (NPR). He has been described by The New York Times as "one of the most popular podcasters in history" and his podcasts have a combined monthly audience of 19.2 million downloads. He is the co-creator of three NPR programs: TED Radio Hour, How I Built This and NPR's first-ever children's program, Wow in the World. In 2016, he became the first podcast creator to simultaneously have three shows in the Apple Podcast chart's Top 20 shows. At age 25, he became the youngest overseas-based bureau chief for NPR, first in Berlin, then London and the Pentagon. He also served as CNN's correspondent in Jerusalem from 2004–2006. As a war correspondent, Raz covered the conflicts in Kosovo, Macedonia, Afghanistan, and Iraq. He has reported from more than 45 countries. Raz is also the creator of NPR's popular literary segment "Three Minute Fiction." Raz is a 1996 graduate of Brandeis University. He received his master's degree in history from Cambridge University in the UK. In 2008, at age 33, Raz spent a year as a Nieman journalism fellow at Harvard University where he studied classical history. In 1997, at the age of 22, Raz joined NPR as an intern for NPR's afternoon news program All Things Considered. He eventually would work virtually every job in the newsroom from temporary production assistant to breaking news anchor. In 1998, he served as personal research assistant to former "Murrow Boy" NPR Senior News analyst Daniel Schorr. During his time as a producer at NPR, Raz also became a freelance writer, mainly for the Washington City Paper, during the tenure of editor David Carr. Raz would go on to write for Salon, the Washington Post, the Christian Science Monitor in addition to several other publications. In 1999, he was awarded a Burns Fellowship to Germany to embark on a 2-month reporting assignment. His reporting would win the Burns Award for distinguished writing. Later that year, he competed to become one of two "reporter-trainees" in NPR's newsroom. He went on to cover the 2000 presidential primaries and the story behind the famous Doors song "Light My Fire" where he interviewed all surviving members of the band. In the summer of 2000, Raz reported from Germany as a RIAS Berlin fellow. His work on German "Leitkultur" was awarded the RIAS Berlin Award. In mid-2000, Raz was appointed NPR's Berlin bureau chief. He covered Eastern Europe including the conflicts in Kosovo, Macedonia and Afghanistan. In 2002, he became NPR's London bureau chief. While in London, Raz covered stories across Europe and the Middle East including the Iraq War where he spent more than 6 months in 2003 and 2004. In 2004, Raz left NPR to work as CNN's Jerusalem correspondent. During his time at CNN, Raz covered the death of Yasser Arafat, the rise of Hamas, Israel's withdrawal from Gaza and parts of the West Bank, and the incapacitation of Israeli Prime Minister Ariel Sharon. Following the 2 years working for CNN, Raz returned to NPR, working as the defense correspondent, covering the Pentagon and the US military. During his time at the Pentagon, Raz was awarded the Edward R. Murrow Award and the Daniel Schorr Prize for his 3-part series on military-medical evacuations from Iraq. In 2009, after a sabbatical year as a Nieman Fellow at Harvard University, Raz became the weekend host of All Things Considered. He is widely credited with transforming Weekend All Things Considered when he took over as host in 2009. He created a weekly "cover story" and the popular segment "Three Minute Fiction." He created a weekly podcast of this show which was the first time an NPR newsmagazine became a podcast. Raz hosted Weekend All Things Considered from 2009 to 2012. In December 2012, he stepped down from that position in order to expand the TED Radio Hour into a new weekly program to air on NPR beginning in March 2013. Raz is the host and editorial director of the TED Radio Hour. Launched in 2013, TED Radio Hour is a co-production of NPR and TED that takes listeners on a journey through the world of ideas. It is one of the most-downloaded podcasts in the United States. Raz is known as the "Cokie Roberts for the 4-8-year-old crowd" as the news analyst for the Breakfast Blast Newscast on Kids Place Live on SiriusXM radio. Raz served as a Ferris Professor of journalism at Princeton University and taught journalism at Georgetown University and George Washington University. In September 2016, Raz started hosting a new podcast on NPR, called How I Built This about entrepreneurship. In 2017, it became one of the 20 most-downloaded podcasts in the United States. In May 2017, Raz created NPR's first-ever children's program. The podcast, Wow in the World, was co-created with award-winning children's host Mindy Thomas. Raz and Thomas also created a children's production company, Tinkercast, which produces Wow in the World. For his reporting from Iraq, Raz was awarded both the Edward R. Murrow Award and the Daniel Schorr Journalism prize. His reporting has contributed to two duPont awards and one Peabody awarded to NPR. He has been a finalist for the Livingston Award four times. Other awards Raz has won include the National Headliner Award, ASCAP Deems Taylor Award and an NABJ award. Raz was born in West Covina, California and now lives in Washington DC, with his wife Hannah Raz, an attorney and their two children. ^ "Guy Raz". NPR. Retrieved 1 January 2019. ^ Peters, Terri. "'Wow in the World': Why NPR started its first podcast for kids". TODAY.com. Retrieved 2018-02-15. ^ Schawbel, Dan. "Guy Raz: What He's Learned From Hosting Two Successful NPR Podcasts". Forbes. Retrieved 2018-02-15. ^ "NPR Launches Guy Raz's New Show About Entrepreneurs". Washingtonian. 2016-09-12. Retrieved 2018-02-15. ^ "Guy Raz '96 | Brandeis Magazine". Brandeis Magazine. Retrieved 2018-02-15. ^ "Guy Raz". NPR.org. Retrieved 2018-02-15. ^ "How Encouraging People to Move on Sparks Innovation". NationSwell. 2016-03-17. Retrieved 2018-02-15. ^ "NOTABLE ALUMNI". Brandeis University. Retrieved 23 March 2016. ^ a b c d e f g h i j "About Guy". guyraz.com. Retrieved 13 May 2017. ^ "Daniel Schorr remembers Edward R. Murrow". TODAY.com. Retrieved 2018-02-15. ^ "How City Paper Remembers David Carr". Washington City Paper. Retrieved 2018-02-15. ^ "Bauer Out". NPR.org. Retrieved 2018-02-15. ^ "Set The Night On Fire: Behind The Doors' 'Light My Fire'". NPR.org. Retrieved 2018-02-15. ^ "2001 – Rias Berlin Commission". riasberlin.org. Retrieved 2018-02-15. ^ "CNN.com - Transcripts". transcripts.cnn.com. Retrieved 2018-02-15. ^ "CNN.com - Raz: Small nation, huge influence - Jan 6, 2006". www.cnn.com. Retrieved 2018-02-15. ^ "NPR NEWS RECEIVES TWO 2008 RTNDA EDWARD R. MURROW AWARDS". www.npr.org. Retrieved 2018-02-15. ^ "NPR's Guy Raz Names Daniel Schorr Journalism Prize Winner | Public Relations". www.bu.edu. Retrieved 2018-02-15. ^ "Revamped All Things Considered brings new sound to weekends". Current. Retrieved 2018-02-15. ^ Fallows, James. "Farewell to Guy Raz at WATC". The Atlantic. Retrieved 2018-02-15. ^ Moss, E.B. (2015-10-22). "Getting to Know "TED Radio Hour" Host Guy Raz". MediaVillage. Retrieved 2018-02-15. ^ "Top 20 Podcasts of 2017". Podtrac. Retrieved 2018-02-15. ^ "NPR Debuts 'How I Built This With Guy Raz'". NPR Press Room. NPR. Retrieved 27 September 2016. ^ Milanes, Nick (12 September 2016). "3 Tips on How to Start a Business from NPR's New Podcast". Gear Patrol. Retrieved 27 September 2016. ^ Hess, Amanda (2017-10-03). "The New Bedtime Story Is a Podcast". The New York Times. ISSN 0362-4331. Retrieved 2018-02-15. ^ "Guy Raz of 'TED Radio Hour' on the everyday failures of journalism". Washington Post. 2016-10-20. ISSN 0190-8286. Retrieved 2018-02-15. This page was last edited on 12 January 2019, at 14:22 (UTC).